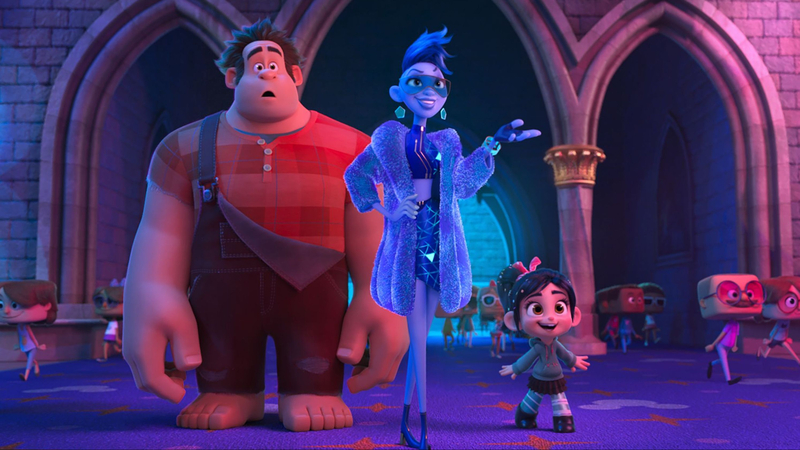 Where Wreck-It Ralph focused on the highs and lows of arcades games, specifically relating to the characters who inhabit them, their lives and individual crises, its sequel Ralph Breaks the Internet lurches forward, opening the world up exponentially as the arcade in which our heroes reside is plugged into the web. The plot sparks to life when the steering wheel of the recently rejuvenated Sugar Rush game is broken. This leads Vanellope (Sarah Silverman) to question her existence, spurring Ralph (John C. Reilly) to action. After overhearing a conversation by kids in the arcade where it’s determined a replace wheel is up for auction on eBay, he throws caution to the wind, deciding the only way to save Vanellope’s world is to enter the internet itself. The duo, who’ve become inseparable in the six years between films, are at first overwhelmed by what they discover – a boundless metropolis in which square-headed avatars shuttle between the likes of Amazon, Facebook and Snapchat, living out the online lives of humans in the fully realised online world. There’s twittering blue birds, bothersome pop up ads and brainy know-it-all – and search helper – Knowsmore (Alan Tudyk). It’s all true-to-life in a way our wildest imaginations could only ever dream. A spanner is quickly thrown in the works when it’s realised Ralph and Vanellope have to way of paying the $27,001 dollars they’ve inadvertently bid to win the steering wheel. This sends them to BuzzTube, where Ralph ends up becoming an instant meme sensation and Vanellope slinks off alone, clickbait ad in hand, to do her bit. It’s here that the theme of friendship really comes to the fore. Ralph, who dotes on Vanellope too much, starts to realise how much – and how selfishly – he relies on her, while Vanellope, with a little help from Disney’s much-loved assortment of princesses (yes, even the incomprehensibly Scottish arrow-wielding Merida), discovers the need to be her own person and follow her own dreams. As you’d expect with Disney, the visuals are superb. The minds of the directors, writers and thousand-odd strong animation team do wonders to develop a rich world full of wonder, intrigue and every kind of Easter egg you could ever imagine. Outside of the princesses, there’s cameos from Eeyore, C-3PO, Sonic, Buzz Lightyear and an almost never-ending list of recognisable characters, both from the Disney canon and beyond. Yet the real success to Ralph Breaks the Internet is how, while having the most amount of fun possible, it’s also able to be cleverly subversive (no longer should the iconic Disney princess be reliant on men to strive) and deeply rooted in its themes of friendship, and all the ups and downs that follow.